It used to be, when you asked a little boy what he wanted to be when he grew up, you’d get a handful of predictable answers. 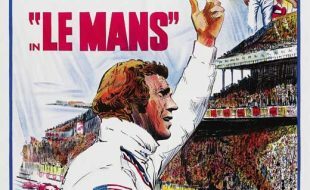 Things like “cowboy” and “astronaut” don’t hold quite the same allure with the youth of the digital age as they did in generations past, but “firefighter” is as popular as ever—and most of us never completely outgrow our fascination. What is it about that calling that captures the imagination? Well, part of it is the awesome vehicles and equipment (the Ferrara Heavy Rescue you see on these pages certainly testifies to that!) but there’s more to it. When a kid says he (or she!) wants to grow up to be a Jedi knight, the parents smile indulgently, but when that same kid says “firefighter” those parents nod with approval. 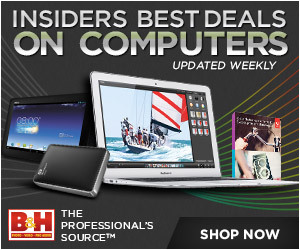 We intuitively understand even from a young age that these guys are heroes—real heroes. We know that on the worst days—when our worlds are literally going up in flames and crumbling down around us—it’s these guys who charge in to save us and make sure we live to see tomorrow. And many of them volunteer to do it. Can there be a more crystalline example of heroism? But what happens when it’s the heroes that need saving? In the case of the Fire Department of the City of New York (FDNY), the ones who answer the call are the five special Rescue Companies—think of them as the FDNY’s Special Forces Units. Rescue Company 1 covers the borough of Manhattan, and when FDNY personnel are trapped or injured, or an emergency is too severe or complicated for the regular personnel to tackle, the company rolls in on its Ferrara Heavy Rescue. The diamond plate and wire mesh vents on the roof are brilliantly delicate workmanship. I really like the lighting and special mirrors (vital in crowded Manhattan) as well. Rescue 1 has been specifically outfitted for the equipment the team needs for its specialized mission, and each of the other Rescue Companies has a matching Ferrara. 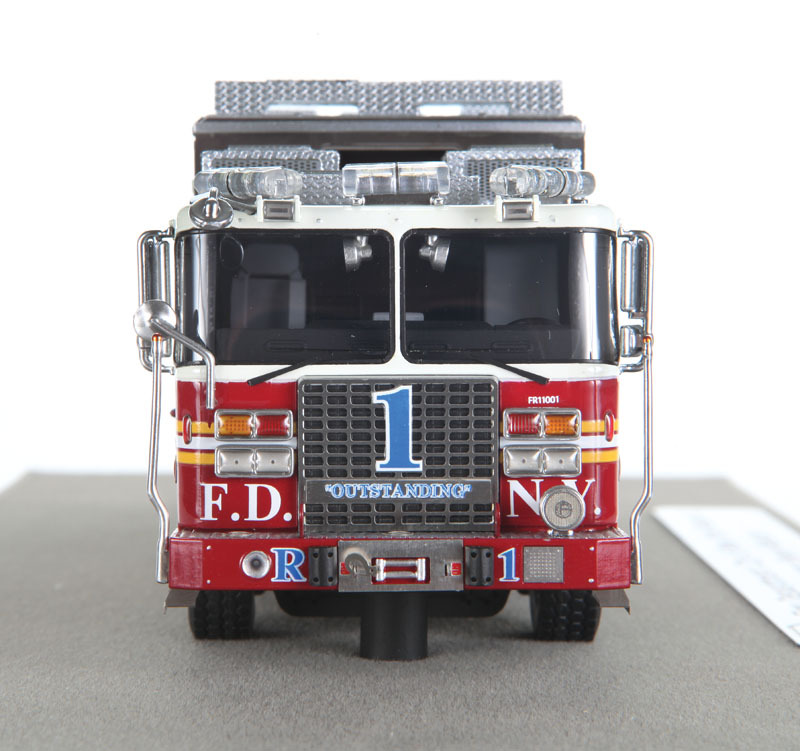 Fire Replicas has produced Rescues 1, 2, and 3 as its latest series of museum-grade 1:50 replicas. 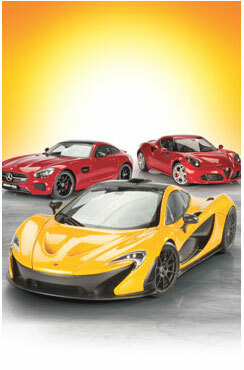 Each model boasts more than 600 individual pieces—triple what many upscale 1:18 automotive models have! The main hulls are high-definition resin—enhanced by brass, wire, rubber, and various composites—and a lot of laser-etched stainless steel. It’s the latter that impresses most on Rescue 1. 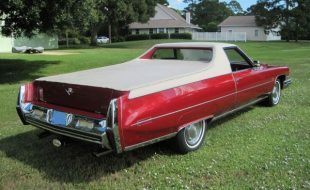 It forms the ladders on top as well as the impossibly fine scale diamond plate and wire mesh vents that cover the entire roof of the truck. 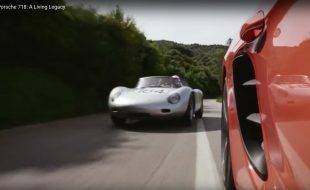 There is plenty more on the flanks: the running boards, boxing the wheel wells of the dual rear axles, forming the steps at the rear and the front grille. 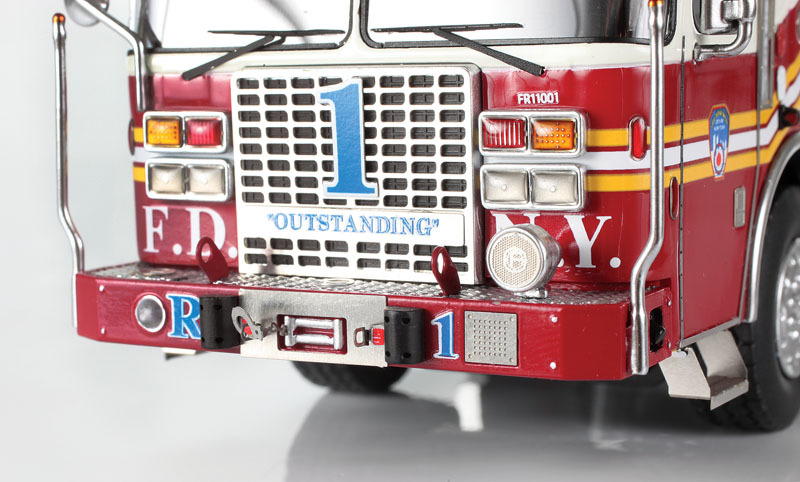 “Outstanding” is the motto of Rescue Company 1 in tribute to their fallen captain Terry Hatton—and an apt description of the detail on this model. You’ll also notice that the grille has an interesting script stenciled across it. In addition to the obvious numeral 1 and “FDNY”, you will make out the word “Outstanding.” The story behind that word—which has become the motto of Rescue Company 1—is both tragic and inspiring, and speaks to the unit’s commitment to its mission. The term was a favorite of Terry Hatton, who was captain of Rescue 1 on September 11, 2001. He and his crew had just come on shift that morning when the call came in, and were among the first to enter the North Tower at One World Trade Center. Hatton and ten other men from Rescue 1 were lost that day—nearly half the company. Ironically, he had just helped design the special truck requirements for the unit, and when the new trucks were delivered—in 2002—Rescue 1 emblazoned them with “Outstanding” as both a commemoration of Hatton’s leadership and a reminder of the standard that Rescue 1 upholds. Every truck since has been so marked, and this model accurately depicts the motto. There are other tribute markings to September 11 on the rig, as well as emblems commemorating the company’s 100 years of service. All Fire Replicas pieces come mounted to this type of velvety base and include a matching acrylic dust cover (not shown). Very classy! What impresses even more than the markings is the effort put into capturing the subtle external details, like the grappling hook attached to the winch built into the front bumper. It’s not just surface-molded; the hook is laser-etched and attached to a braided metal wire cable. I also like the extra mirror mounts on the front of the truck. Being assigned to Manhattan, Rescue 1 trucks must contend with the particular hazard of close-quarters pedestrian traffic. The special convex mirror on the upper right allows the driver to see if pedestrians are close to the truck both directly in front and around the right front corner, which would otherwise be too far below the windshield line to be seen directly. The lighting is another highlight. There are spinners on the top of the cab and fixed flashers at various places around the superstructure—all done with nicely colored and textured translucent lenses. Clear plastic windows give a nice view of the interior, which is well detailed but understandably not quite up to the exemplary level of the exterior. Look at the attention to detail on even the most mundane features! Fire Replicas does an excellent job capturing the look of the wheels and tires, correctly molding a larger diameter single tire for the front and lower profile doubles for each of the rear axles. 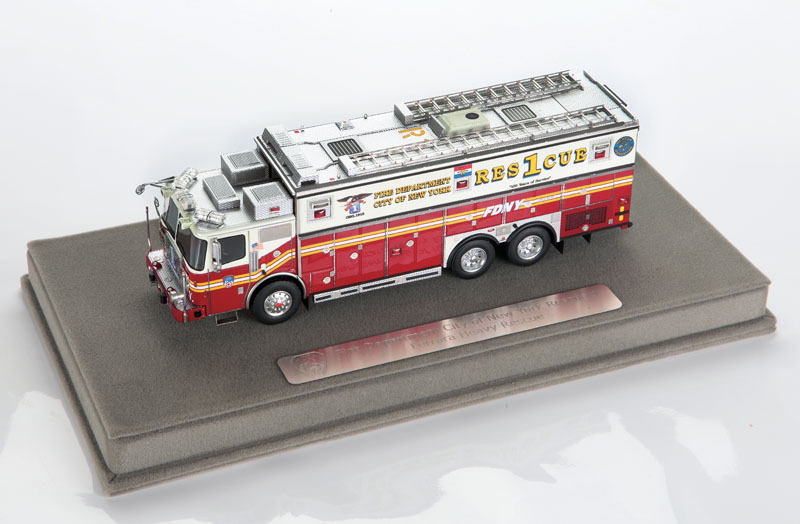 Like all Fire Replicas releases, the Rescue 1 comes with a velvet-covered base, with a laser-etched plaque identifying the model and depicting the FDNY crest, that fits perfectly into the included acrylic dust cover. The model can be removed from the base—as we did for some of our photos—but the presentation of the base is so nice most owners will probably keep it mounted. I love the braided cable and etched hook on the winch. 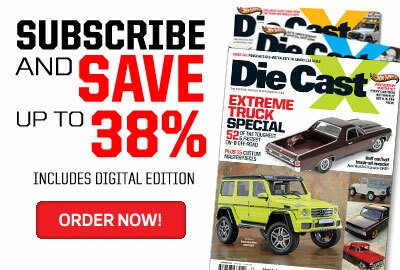 Remember that this truck is 1:50 scale! 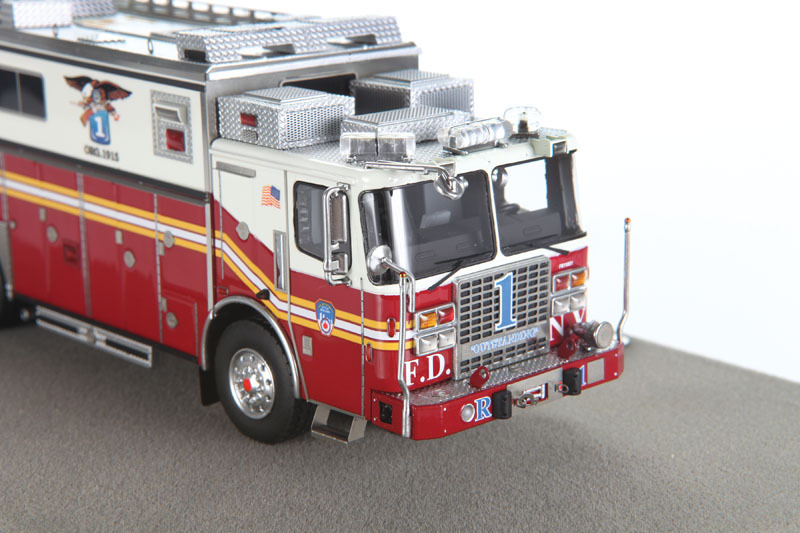 In anticipation that all three FDNY Rescue models will be in high demand, Fire Replicas is trying something new with these limited editions. 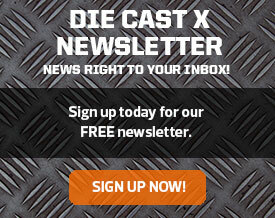 Each truck will be limited to a total of 300 units, but the production run will be split into two runs. 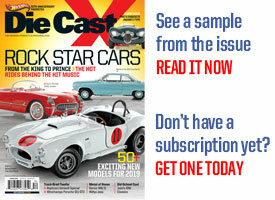 The first 150 of each version will be available by the time you read this, and we predict will sell out quickly. 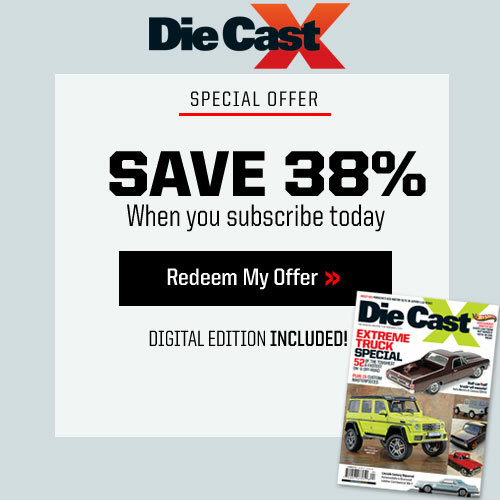 But if you miss that first run, the second 150 of each will go on sale in 2018, giving you a second crack at a model that will certainly be in high demand. 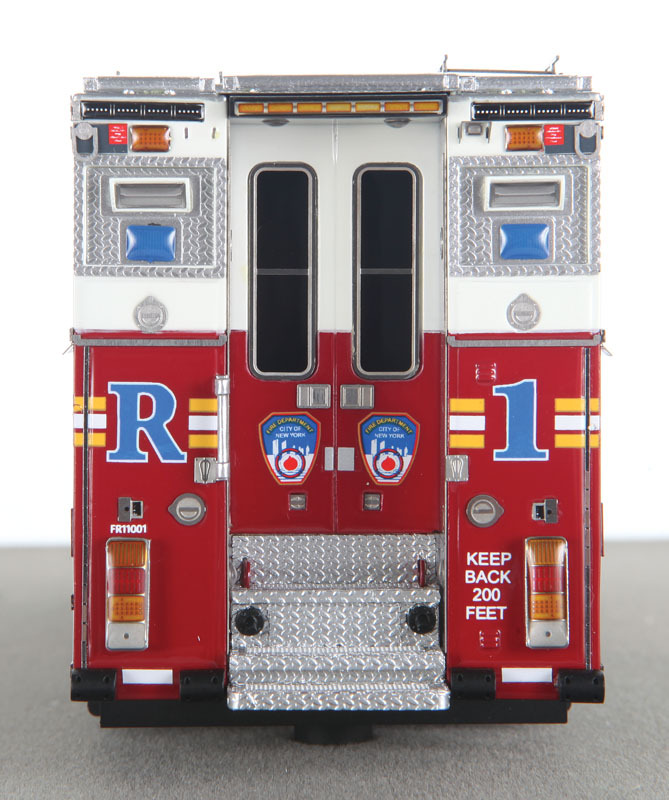 You can pre-order them on Fire Replicas’ website, and it’s a good idea to do so—particularly if you want Rescue 1! 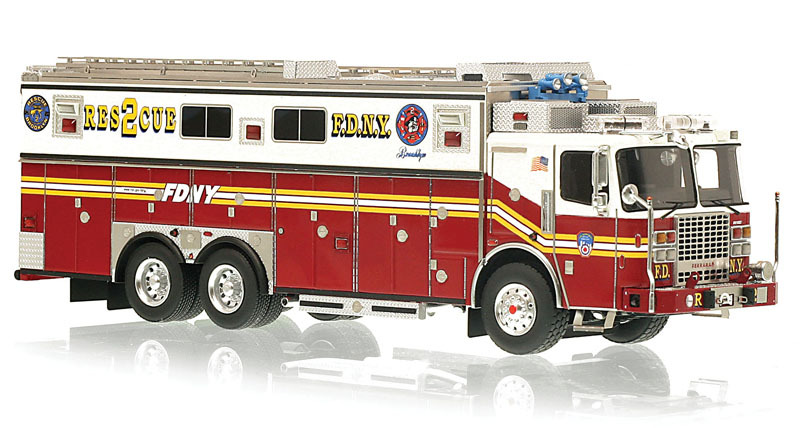 In addition to Rescue 1, Fire Replicas is producing 1:50 replicas of Rescue 2 (Brooklyn) and Rescue 3 (Bronx). 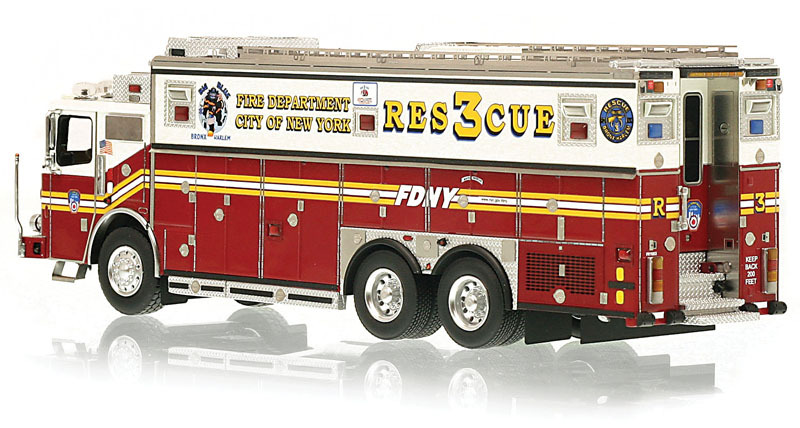 As you can see here, all three trucks share the same outstanding levels of detail and quality of assembly, down to the unique and accurate markings that reflect each respective Rescue Company’s insignia. All the trucks will be limited to 300 pieces each, with the first half available by the time you read this, and the balance of production coming in 2018. 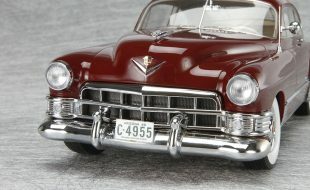 If you miss the first allotment, you can preorder a model of your preferred truck on firereplicas.com.